Lambic is the closest thing we have to the ur-beer, to humanity’s batch 001. Natural inoculation—the miracle of air transforming grain and water into something more—happened right at the start of civilization. Some anthropologists even claim our nomadic species only settled down so we could cultivate grain for brewing. Ever since we accidentally created beer some 10,000 years ago, brewing has been a struggle to wrestle wild fermentation into submission. All over the world, disparate societies tried to repeat their best batches, to bring out certain flavors and suppress others. Slowly, superstition gave way to scientific discoveries, to concepts such as hygiene and the awareness of yeast. The progress of humanity can be tracked in our journey from spontaneous beer in clay pots to tallboys of IPA. Modern-day scientific and technological innovations have since made reliable, “clean” beer the norm. But if spontaneous beer is the alpha, it might be the omega, too. 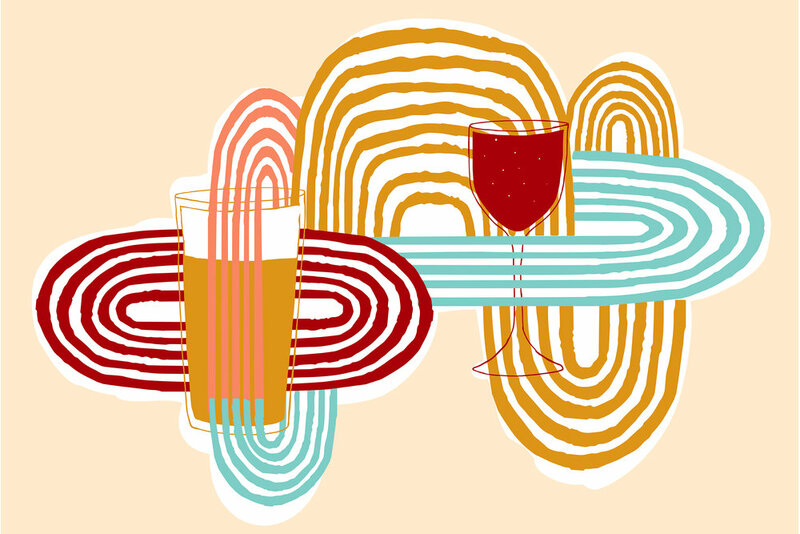 As standing room gets tight in the crowded world of Pilsners and IPAs, experiments with wild fermentation have become the new frontier. The next logical step in beer’s long timeline is a return to nature, and to our earliest origins. Many Belgian brewers tend to scoff at the idea of “craft beer.” Even though its ideals and methods are similar to the virtues they’ve championed for centuries, they’ve often felt left behind by the scene’s changing tides. (Of course, even those tides in Belgium are now changing in new and interesting ways.) Where beer lovers used to force bottles of Duvel and Saison Dupont on their friends, they now peddle New England IPAs and fruited Goses. Where Westvleteren XII was the undisputed king of beers on review websites, it now looks over its shoulder at an army of American Imperial Stouts. Until recently, Belgians could take comfort in the fact that no one else produced Lambic. The historical, spontaneous style was unique, thanks in part to the microflora native to the Senne Valley, located just southwest of Brussels. Nature didn’t just bless this area with the right yeasts and bacteria—it also endowed it with an ideal climate for slow fermentation, easy access to French wine barrels, and even tart Schaerbeek cherries. Lambic was the envy of the beer world, inimitable and unmovable. Or so those beer makers thought. Once known as “the Champagne of Brussels,” Gueuze—a spritzy, funky blend of aged Lambics—had, by the 1980s, ceded serious ground to more approachable and easily made Pilsners and Blond Ales. Producers that survived those dark times did so by dosing their beers with sugar, or exporting them to discerning drinkers abroad. But the necessity of expanding into new markets ultimately helped traditional Lambic brewers revive interest in the previously waning style. Younger, international generations of beer drinkers began to develop a taste for funkier beers, and producers like Cantillon started to see hype grow around seasonal releases like Lou Pepe, the scarcity of which further stoked prices and demand. As a result, the appetite for Lambic and Gueuze is now at an all-time high, though new drinkers—brought up on endless seasonal beers, conditioned to look for the novel and the rare—have spurred on modernization and change within these tradition-bound categories. Lambic’s name, process, and origin are all protected by EU law, so treading the line between heritage and innovation is precarious. Even so, blenders and brewers both young and old are starting to tear down decades of conservatism. Oud Beersel, a Lambic blender with a 130-year history, closed in 2002, only to be revived by a young Lambic fan, Gert Christiaens, three years later. Christiaens played it safe with his first few beers—he even contract brewed a Tripel to ensure volume—but in the past few years has started to push the boundaries of Lambic blending. One experiment in particular, Green Walnut Gueuze, has become a hyped annual release, thanks to its aromatic potency, fleshy olive notes, and uncharacteristically strong bitterness. The idea sounded promising, but to Christiaens’ knowledge, green walnuts had never been used in beer before—there were no existing records or recipes to consult. With other experiments, the risk wasn’t so great—rose petals and ex-spirits barrels can only affect a beer so much. But green walnuts are so bitter that they are inedible on their own. In a sweet, Italian liqueur it is possible to balance them out, but in a dry, Bretty Lambic, they’re overpowering. He may have a modern outlook, but like any traditional Lambic blender, Christiaens will tell you how important it is that the underlying beer still shines through any added ingredients or aromatics. Lambic needs to modernize to grow, but it can’t divorce itself from tradition—especially now that the beer world has realized that Lambic-style beers can be made almost anywhere. Yeast is all around us. It’s in the air, on trees and their fruits, in our hair and our beards. Many yeast strains aren’t suitable for brewing, but it’s still possible to create spontaneous beer pretty much anywhere. How good it tastes depends on the complex interplay of wort, strain, climate, and other hyper-local conditions. It’s a stark contrast from most modern beers, which are made using factory-propagated yeasts (not to mention malts and hops that hail from all over the world). In the ever-more-crowded beer world, a young brewery can still use spontaneous fermentation to plant a flag and proclaim its unique terroir. Jester King, located many thousands of miles from Belgium in Austin, Texas, was one of the first U.S. breweries to seriously pursue traditional, spontaneously fermented beer. It installed a coolship—an open vessel that encourages inoculation of the wort by wild yeasts and bacteria—in 2013. The news wasn’t greeted with joy by the brewers of the Pajottenland region, however, and the High Council for Artisanal Lambic Beers (HORAL, translated from the Dutch) expressed concern over the brewery’s intention to use the word Gueuze on its bottles. Surprised by the Council’s resolve, Jester King settled on the term “Méthode Traditionelle,” which, while less catchy, still acknowledges the brewery’s reliance on traditional brewing techniques. The beer worked, but not without some adaptation to the environment. Traditionally, wort has to remain in coolships overnight in the open air; due to temperature constraints, the brewing season in Belgium only lasts from late autumn to spring. In Texas, though, the season starts in December and finishes by February, and the barrels must be kept in temperature-regulated rooms. There are benefits to brewing in such a climate, however. The local produce that Jester King adds to its beers is one major asset. The brewery uses ingredients such as blueberries, pitaya, and grapefruit—and even sources its barrels from Texan vineyards. The thrills of experimentation aside, spontaneous beers—due in part to the unpredictability of nature—can also go very wrong. Wild Beer Co, founded in 2012, was an early trailblazer in the realm of spontaneous and mixed-fermentation beer in the U.K. Located in Somerset (a part of the country that’s famed for its apple orchards and cider production), the brewery sources yeast strains found on local fruits, though it also looks farther afield for inspiration. Back in 2015, Wild Beer Co made Yadokai in collaboration with London restaurant Nanban and two Edinburgh beer bars. A sake-inspired Wild Ale, the beer was brewed with Scottish seaweed, sea buckthorn, and yuzu, and then barrel aged for two years. Though Yadokai was bottled and released to great acclaim, six months later the brewery started receiving reports that the beer had turned to sludge in the bottle. It was found to have “ropiness,” a rare condition caused by Pediococcus bacteria that turns beer into stringy jelly. It was a happy ending for Wild Beer Co, though not everyone sees the fun in sitting on a pallet of seriously infected beer. Despite its international reputation and reach, or perhaps because of it, no such risk is taken at Mikkeller Baghaven, Mikkeller’s wild beer facility in Copenhagen. There, master blender and brewer Ehren Schmidt makes use of diverse fruits and yeasts, but also employs his microbiology background to understand as much about what goes into his beers as possible. The average drinker would have no idea such rigorous processes were used to make their beer, but this approach allows Schmidt to better predict the behavior of various yeast strains, and to plan his recipes accordingly. Still, that doesn’t remove the role that chance plays in the end results. Given the trials and tribulations involved in the process, it’s likely that Lambic brewing didn’t become conservative through any kind of protectionism, but instead because repetition is often the best way to produce reliably delicious beer. If a certain origin of barrel works, use it again. If a species of raspberry gives the best results, don’t mix it up. History and experience seem to be as valuable as a laboratory to traditional Lambic makers. For the new guard, however, innovation trumps replication. Mikkeller founder Mikkel Borg Bjergsø’s restless, ever-evolving business approach translates to his Lambic production. He’s produced a series of Gueuzes in partnership with Boon, and also makes his own, ultra-fruited versions at De Proef, using base Lambic he secures from traditional producers. From there, it’s a blank canvas. At roughly 75% fruit, the Lambics Bjergsø makes at De Proef stray far from tradition and balance. It’s arguable whether the distinctive, aged character of the base beer is perceptible at all amidst the shower of fruit goop and unfermented sugars. These beers are joyous in their own way, but are also stripped of the style’s characteristic nuance. Naturally, people line up around the corner for them at beer festivals. Some of Bjergsø’s Lambic projects focus on a more even blend of heritage and novelty. Take Spontanbasil, a collaboration beer made with Lindemans—a 200-year-old, family-run Lambic brewery that has previously earned condemnation for sweetening its beers. Lindemans seemed as unlikely a partner for Mikkeller as basil might be for a Lambic. But Spontanbasil was released in 2016 to instant adulation, to the surprise of both parties. Together they lined up a collection of possible ingredients, which they aged individually in Lambic for six months. Included in the lineup were common gin botanicals, including juniper and cardamom, as well as both hard and soft herbs. There was still the small issue of explaining the new beer to the brewery team (only the brewmaster initially objected) and creating a consistent Gueuze that replicated the vivid aromas they had created in the test batch. In the end, Lindemans added chopped basil leaves to giant tea bags and left them to macerate in the final blend for a few hours just before bottling. The result combines classic Lambic funk with aromatic basil to produce a beer that tastes like pesto mixed with lemon juice. It’s polarizing, but striking. Spontanbasil’s success is proof of many things we are encouraged to believe about craft beer—that pushing boundaries is good for the industry, that collaboration is better than competition, that tradition and innovation are not opposed. Some Lambic drinkers and brewers may still bristle at the idea of Lambic-style beer being made all over the world, but that growth also helps their cause. The microbes have always been there, after all. It’s just that now the ideas are really starting to spread.